It's All About Rubbernecker Today! 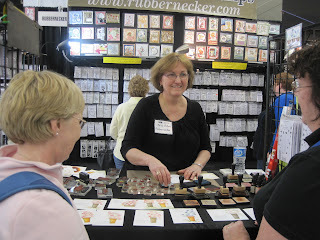 What a fun time Anne and I had at the Rubbernecker Booth at the Creative Keepsakes Convention in Manchester, NH this weekend. 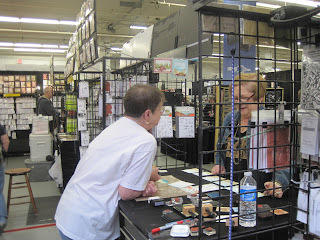 We spent about 8 hours both Friday and Saturday stamping demos for the scrappers and stampers that stopped by the booth. In honor of the event I have two cards - both using Rubbernecker stamps - that I made for some challenges over on Split Coast this weekend. 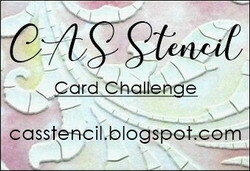 I made this first card for the Featured Stamper Challenge. 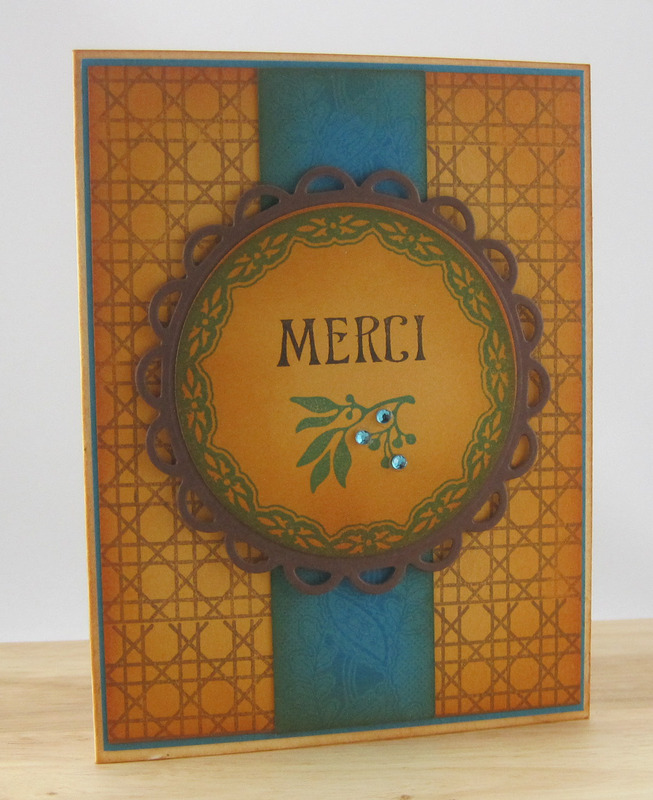 I chose to CASE Linda's Gratitude card as I had a similar silhouette rose stamp. 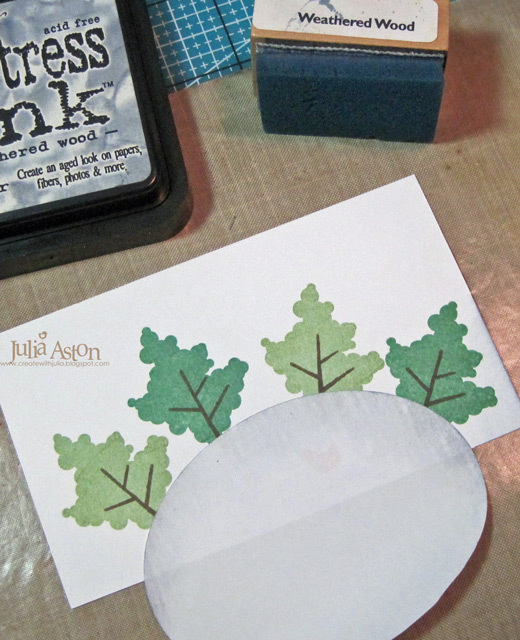 I inked the rose and leaves with red and green markers - huffed on it to moisten it and stamped it on the card stock. 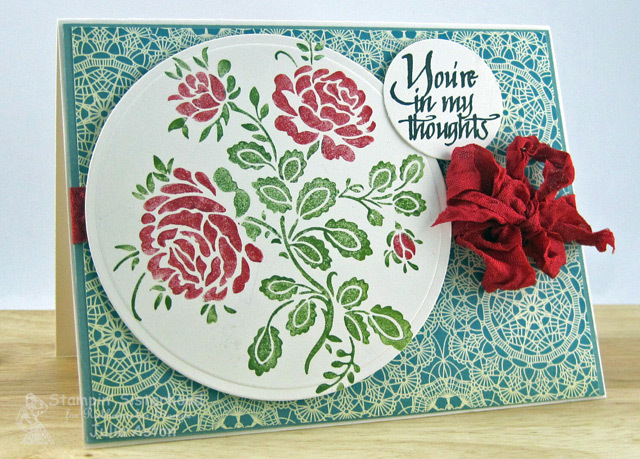 My silhouette rose stamp was bigger than Linda's so I cut it with a circle Nestability instead of using a rectangle shape so that the pretty patterned paper showed a little more. I changed the design a bit - tying wrinkled seam tape across the middle and stamping my sentiment in a punched circle. My second card was made for two SCS challenges - Queen For the Day and the Inspiration Challenge. I was inspired by this Birthday Blessings card by Queen Holly (Toy) I used different images - making mine a new baby card but I used her great design. And for the Inspiration challenge - I was inspired by this whimsey animals baby rug. 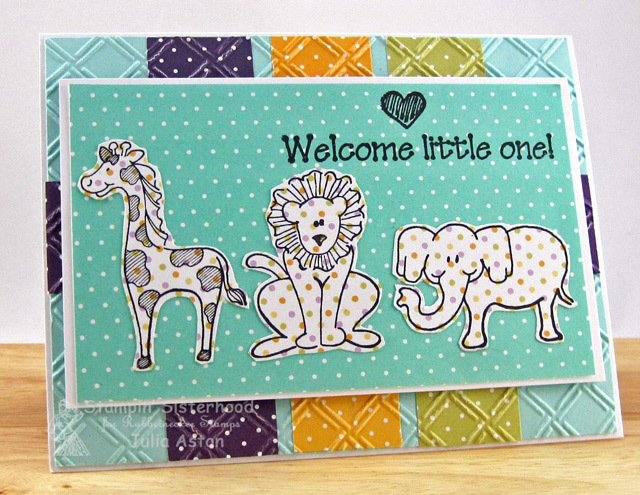 I stamped the animals on dotted patterned paper, cut them out and layered them over more dotted paper! I embossed the back panel with a Wicker Weave embossing folder after I had adhered the patterned paper strips so they got embossed as well. I stamped the sentiment directly onto the patterned paper. 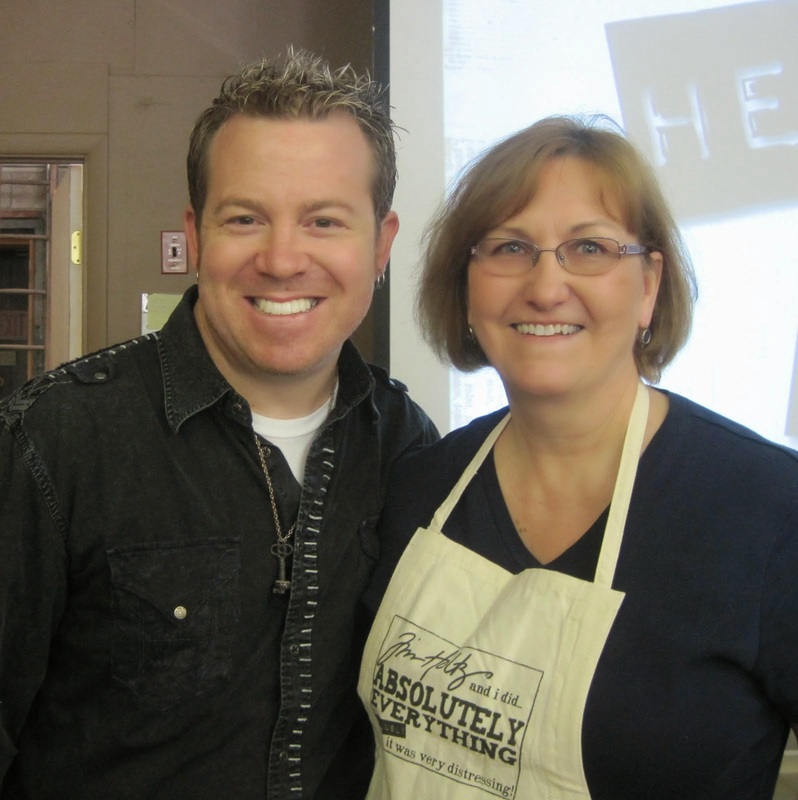 Here are pics of Anne and I working the RN booth. Anne was demoing the Beach Kittie Kit and I was demoing the baskets, pots and sentiment Garden sets. We had such a fun time - but our backs, legs and feet were killing us after standing pretty much the whole time for two days! The things we do for the joy of stamping! So here's my story about the two cards - I was making my card for the Color Challenge over at Split Coast and the colors were Pool Party, More Mustard and Early Espresso. 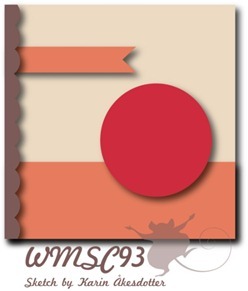 Somehow I pulled out Island Indigo instead of Pool Party and made this card using the WMS sketch. When I was completely finished and writing up what I used on my card - I realized I had used the wrong blue!! There was no way to rip it apart and change the blue to Pool Party! 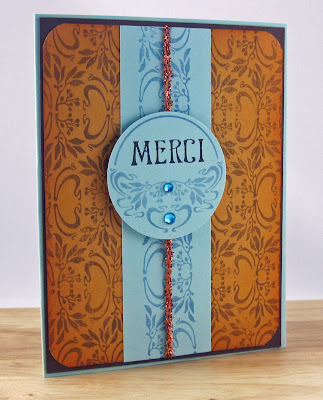 On this card the caning background is from Heirloom Patterns, the border stamped on the blue panel is from French Country, the circle stamping is from Vintage Circles Small and the floral stem and Merci are from Paris Nouveau. So then I made this card using the correct Pool Party Blue! How much lighter the card looks using this blue! All the stamps on this version are from Paris Nouveau. Tonight I'm heading out to Manchester, NH with my stamping buddy Anne (jdmommy on SCS). 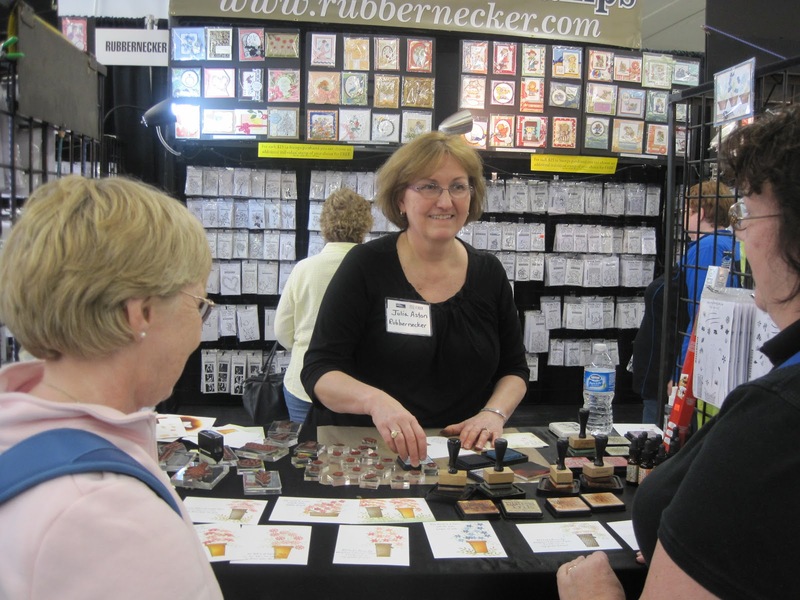 We're going to be working the Rubbernecker Booth at the Creating Keepsakes Scrapbook Convention on Friday and Saturday. If you're by any chance going to be there - come over and say hello! Wow - I can't believe my last week as Guest DT for the Color Throwdown has arrived already! Where did April go??!! I have had a great time being out of my comfort zone trying to work with 4 colors - and was honored to have my work posted beside all the creative, inspiring Throwdown Design Team members each week. So here are the colors we have to work with this week! Oh my gosh - there are FIVE colors here!! I made my card without really registering that fact!!! I just love these Emerson Stamps - I have about 5 of them and I don't ink them up enough!? I just look at them in the box in my craft room - read their sentiments and nod my head in agreement.... What's with that??! Do you have stamps like that - ones you like but forget to use??! The sentiment on this one says "Listen Honey - God didn't promise it would be easy....He just promised it would be worth it!" Very humbling don't you think?! So - now YOU can try using 5 colors!! 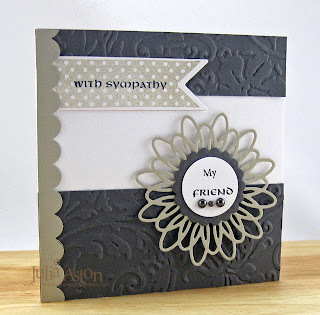 Check it out at the Color Throwdown blog and link up your card there! If I can do it - so can you! And also see all the wonderful inspiration from the Design Team - they are SO awesome! Paper: White, Scarlet Jewel, DP Echo Park This and That Paper Pack. Accessories: Saddle stitched ribbon Aqua Mist - PTI, foam tape, Copics: E00, E33, R05, R20, B37, Y21, Tiny Twinkles - Taylored Expression. Hi stampers! 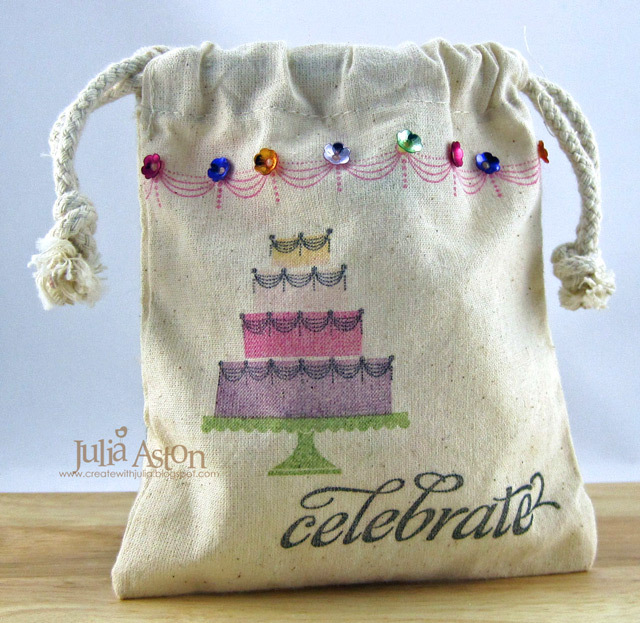 Today I'm sharing a cute little muslin bag that could be for either a wedding or a birthday given the pretty layered cake stamped on it! If you visit my blog often - you have seen me stamp on these wonderful canvas muslin drawstring bags often - they are 5x6 - the perfect size for small treats. I get them at Pouch Mart - and they have several other sizes. 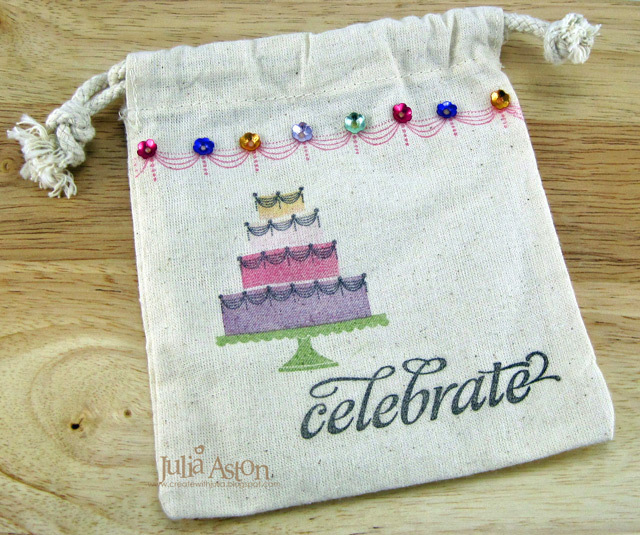 I inked the solid cake stamp with 4 colors of Dew Drop Memento Inks (the dew drop shape makes it easy to ink small sections) and stamped it on the muslin bag. I stamped the swag along the top and adhered colorful sequins to it. Then I stamped the sentiment along the bottom. My stamps are from Eat Cake and Say It Loud by Waltzingmouse. 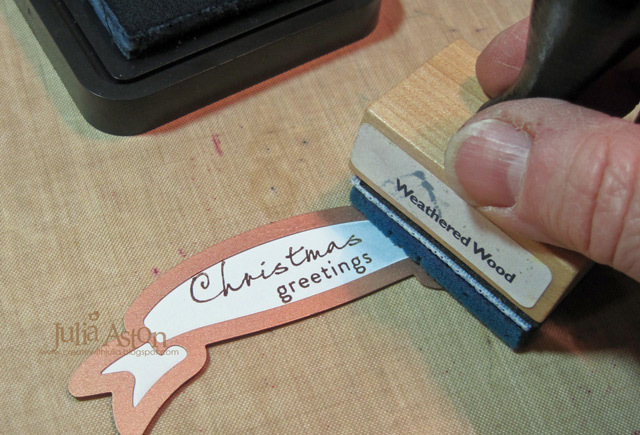 When stamping on any material, it's a good idea to iron it first to smooth out any wrinkles that would prevent you from getting a clean stamping. I also slip a piece of craft foam inside to cushion the stamping. So much more fun than just using wrapping paper don't you think?? And the recipient has a little keepsake of the event! If you are interested - you can see all of the bags I've posted on my blog here. Ink: Sweet Plum, Rosebud, Angel Pink, Cantalope, Bamboo Leaves - Memento, Versafine Onyx Black - Tsukineko. Accessories: 5”x6” canvas muslin drawstring bag - Pouch Mart; metallic cupped flowers - Cartwright’s. Hi stampers! 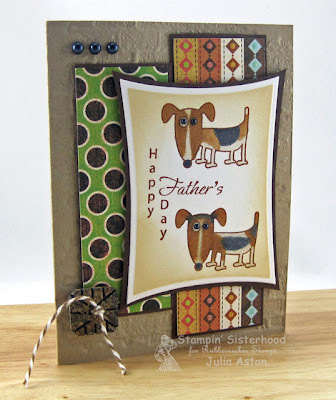 Welcome to the Rubbernecker Design Team's Stampin' Sisterhood Father's Day Blog Hop! We're here to give you lots of ideas for cards for those men in your life! Be sure to read all the deets below to see how you can win some Rubbernecker rubber!! 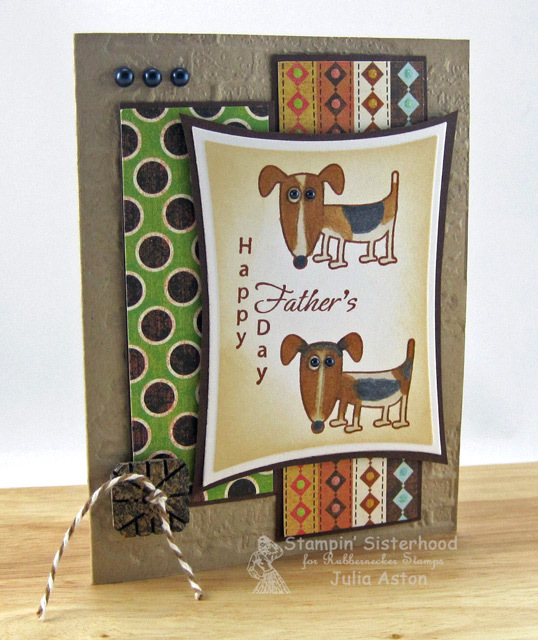 I made my Father's Day card for my son - who is father to two basset hounds - Daisy and Roscoe. Yes - my grandchildren are dogs (!) and they are very loving and cute! The doggie stamp is not a basset hound - his ears are too short - but close enough I say! I attempted to color them with the appropriate areas of white, black and brown. I'm sure Josh will say I woefully failed in that attempt! but at least I tried! Here are the real doggies - Roscoe is on the left and Daisy is on the right. Roscoe still sits pretty and Daisy loses interest in looking at Grandma's camera! 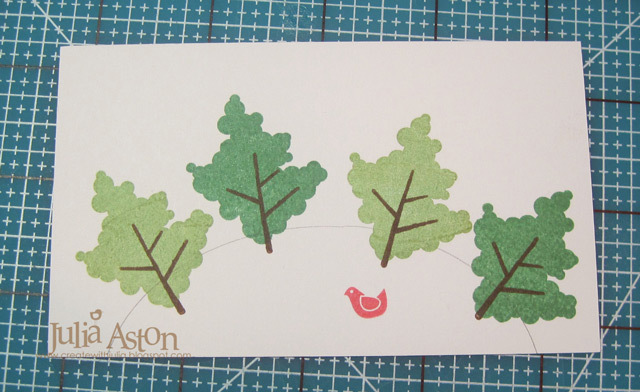 I used the April SFYTT sketch for my card - using a wonky rectangle instead of a circle. 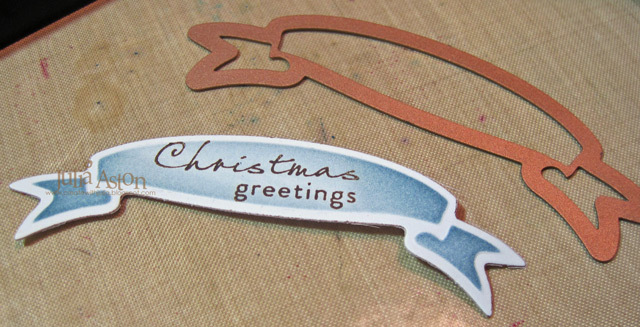 I thought it made the card a little more jumpy - just like the dogs! So here you go with all the details! 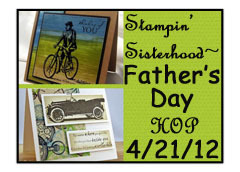 Winner to be announced on the Stampin' Sisterhood Blog on 4/28 (you have 1 week to hop!). -As a bonus we will draw an EXTRA winner for a STAMP SET of your choice, just for sharing our HOP on your Facebook page or Blog!! 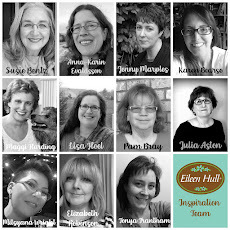 -After you have SHARED, just go back to the Stampin' Sisterhood Blog and let us know where you have SHARED our HOP!! Accessories: foam tape, glue dots, opaline half pearls - Basic Grey, Bricked embossing folder - Tim Holtz Sizzix, wonky rectangle - Nestabilities, Copics: E31, E35, E40, N6, Button from stash, cappuchino twine - the Twinery. I was the color hostess this week for the color challenge over at Split Coast and I chose 3 neutrals to play with - white, grey and sand - I know - sounds bland - but I like the quiet of neutrals once in a while and I think we can do a lot with it - don't you??!! I was inspired by a picture I saw in a magazine of some lovely curtains of grey and white wide horizontal stripes against a sand colored wall - and my color choices were chosen! I made a sympathy card with my colors - using wide stripes of white and grey and accents of sand - with the scallop strip, the banner and the Memory Box Amana Circle die cut. My stamps are Waltzingmouse - Bitty Banners and Celtic Heritage. 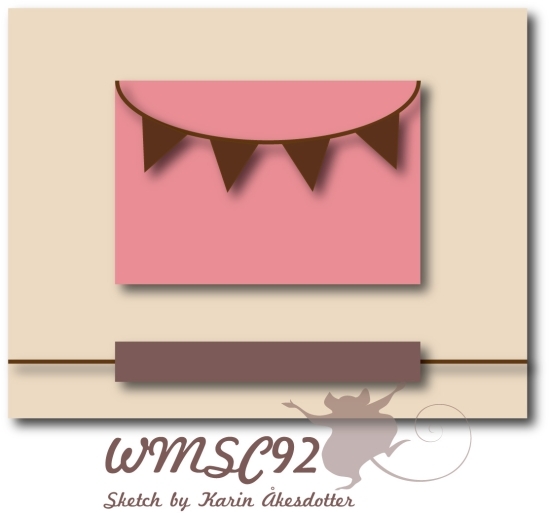 I used the Saturday Waltzingmouse Sketch for my card. Isn't this a fun sketch? 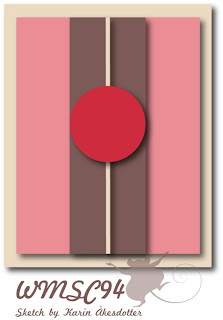 So what do you think of my 'all neutral colors' card?? Check out all the neutral color cards in the SCS color gallery this week! Accessories: foam tape, springtime background texture weave embossing folder - Tim Holtz/Sizzix, Amana Circle die - Memory Box, pewter pearls - Basic Grey, scallop punch - SU, 1" circle punch, lacey circle and nested pennants Nestabilities. 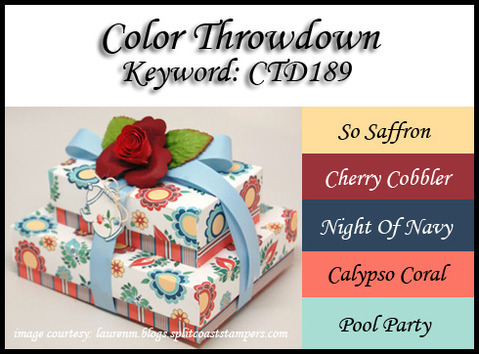 Color Throwdown CTD188 - Hello! Wow - we're already at week three of my time as Guest Designer for the Color Throwdown - time sure flies when your having fun stamping! Look at this gorgeous wreath we have for inspiration this week! I would love to have this on my front door - wouldn't you??! I used all the challenge colors stamping different layers of my doily creation. The top three layers are circle punched and layered with foam tape. I used my corner rounder on just two opposite corners and layered the image on the two pinks adding the simple sentiment - Hello - to the corner. To finish it off I added some bling to the doily! The stamps are from the sets Dainty Doilies Large and Fancy Phrases by Waltzingmouse. 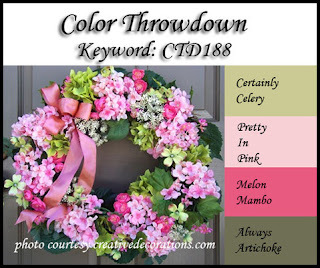 I hope you'll join us in using these beautiful colors this week - check it all out at the Color Throwdown blog. Stamps: Waltzingmouse - Dainty Doilies Large Set, Fancy Phrases. ﻿Today I'm participating in the April Waltzingmouse Blog Party - The theme this month is "New Beginnings"
My new beginning is a baby - First I made a baby girl card (my niece is having a baby girl in August - so I have been thinking ALL PINK lately!) I stamped the back panel with the gingham stamp from Gingham & Co. The sentiment is from Say It Loud. My sister-in-law gave me a bag of these pretty ribbon flowers so I don't know where they came from but I think you can get them at Joann's or Michaels. The bow is matte pink raffia from Pouch Mart. I also decorated this sweet pink gingham bag, using the same sentiment, punched and die cut circles and raffia bow. I love how fluffy the raffia looks when you pull it to open it up - I do that after I tie the bow. The bag is 3"x4" and would be perfect to tuck in a little bag of mints, a small gift or as a favor at a baby shower! I sponged the edge of the punched circle with Antique Linen Ranger Distress ink. Doesn't the gingham stamping match the gingham bag perfectly!! You can find all the details about the WMS Blog party here. 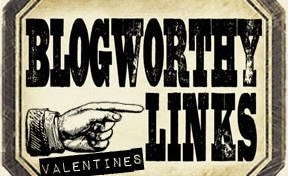 We have one every month on the 17th - and the theme is disclosed on the WMS blog on the 1st of each month so you have plenty of time to make your creation - check my sidebar - the notice about it is always there! Stamps: Waltzingmouse - sentiment from Say It Loud, gingham background from Gingham & Co.
A Butterfly Sympathy and 2 Reminders! Just popping in to share a CAS Sympathy card I made for last week's Featured Stamper challenge over on Split Coast. And to remind you about the April Sunday Stampin' Sisterhood Sketch challenge - there's still time to join in! My card is posted over there today, (and you can see it here on my blog )so I hope you check it out! Also - the Waltzingmouse Blog Party is coming up on April 17th where the theme is new beginnings - think wedding, babies, new blooms in the garden?? See details here. Come join the fun! I was inspired by Ali's Less is More Aqua card. 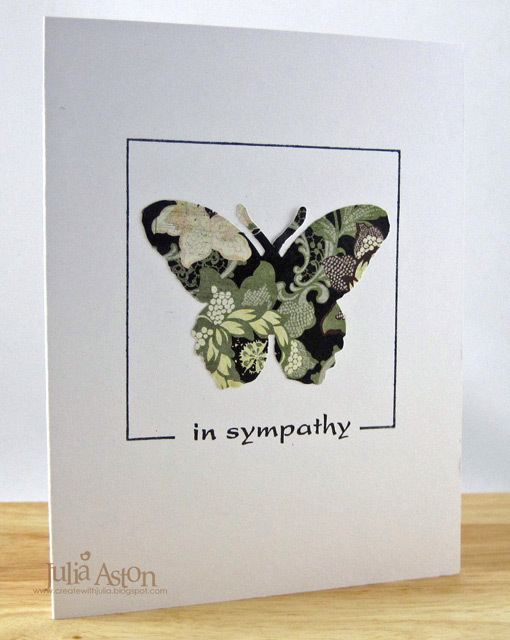 I have the same butterfly die she used - but I used a die cut of patterned paper layering it on the card base, rather than die cutting it out of the front panel as she did. I used a frame stamp instead of scoring lines and used a sympathy sentiment instead of get well. This is a great card for making multiples as it's so easy! My stamps are from Waltzingmouse - the frame is from the Frame It set and the 'in sympathy' sentiment is from Asian Gardens Additions. I have a cute little kid card to share with you today! My super hero is a digi imge from Mo's Digital Pencil called 'Ta Da' from the Super Kid set. Don't you just love his skinny little legs in the grey wrinkled tights??!! 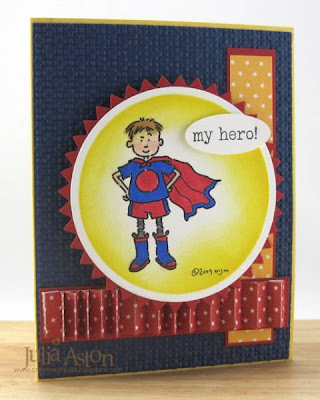 My sentiment is from Half Pint Heroes by Waltzingmouse. I colored the image with Copics, die cut it with a circle Nestability, sponging it with Mustard Seed distress ink before taking it out of the die. I layered it to a pinking circle Nestability. I cut the red star patterned paper with Tim Holtz Rosette die and layered it over the bottom strip. The background is embossed with Square Lattice from SU. 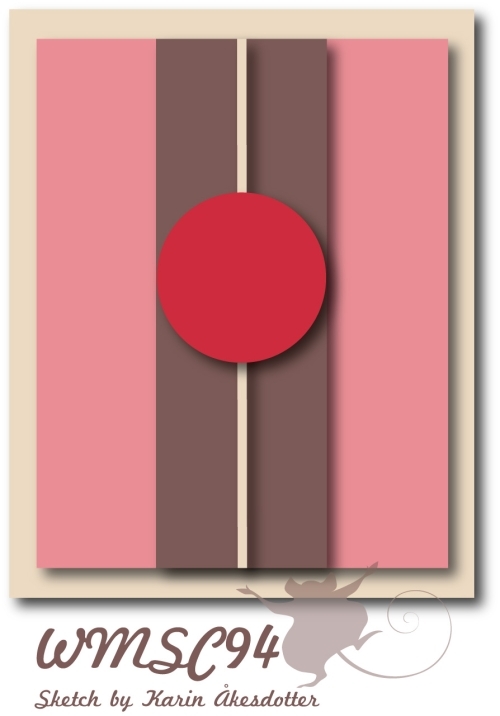 I'm entering this card in Mo's Digital challenge #130 - "I see SPOTS with a Mo Image." My spots are actually stars so I hope this counts!! I'm a Guest Bar-Tender at the Raise the Bar Challenge #100! 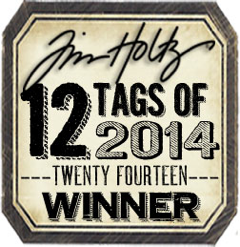 I had the honor of being chosen a Guest Bar-Tender over at the Raise the Bar challenge blog last week for this card. 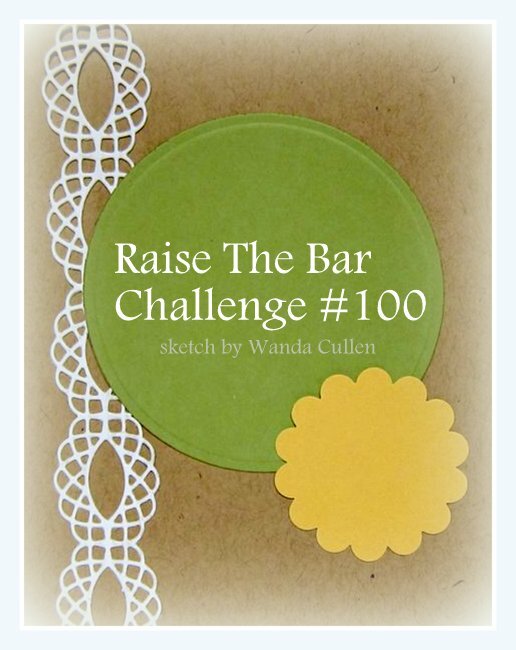 This week's Raise The Bar Challenge is a wonderful sketch by the ever talented Wanda Cullen! As you can see - they are celebrating their 100th challenge this week. I used Kraft card stock as my base as well as behind my patterned paper scallop panel and circle. I went literal with the 100th challenge and die cut numbers 1-0-0. 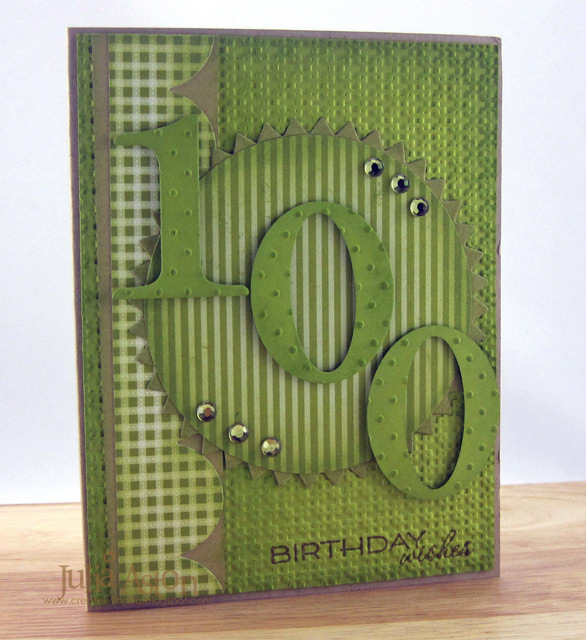 So this card says "100 Birthday Wishes" - which could be for a person turning 100, or just a LOT of wishes for a younger person!! The scallop die and number dies are from Papertrey Ink. I used two embossing folders on this card - for the back panel I used Square Lattice by SU and for the numbers I used Swiss Dots by Provo Craft. I sponged the edges with Simply Chartreuse Ink from PTI and added some rhinestones for a little shimmer! My sentiment is from Fancy Phrases by Waltzingmouse. I stamped the sentiment first - and then embossed the panel. So take a look at all of the Design Teams' Inspiration over at the Raise the Bar Blog and join in by linking your sketch card over there - you could be chosen the Guest Bar-Tender too!! Accessories: number and scallop die - PTI, circle and pinking circle Nestabilities, swiss dots embossing folder - Provo Craft, Square Lattice Embossing Folder - SU, foam tape, rhinestones - Kaiser Craft. 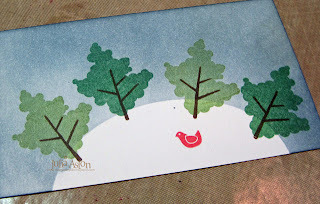 Lynn has the Waltzingmouse April Christmas Card Challenge up in the WMS Forum. Her challenge for us this month is Birds and Trees. 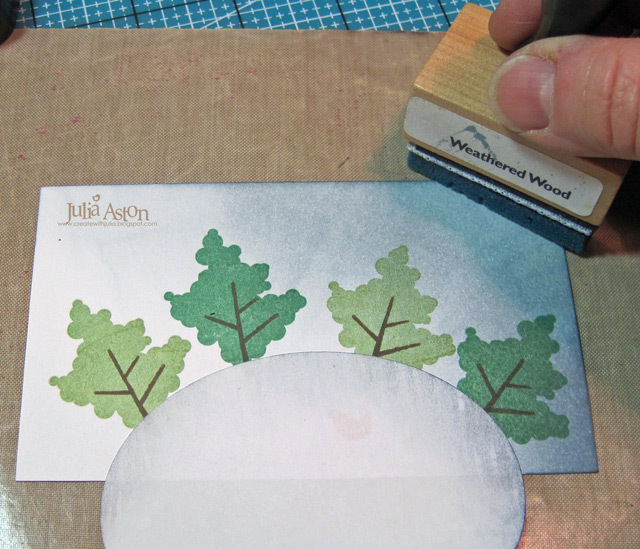 And I used the April 7th WMS Sketch for my card - turning the sketch upside down - using trees instead of banners! Then I die cut the oval out of a piece of Eclipse Tape to use as a mask. I placed the mask over the area I wanted to keep white and then sponged over the rest of the card starting at the outside edges and moving in towards the center in a circular motion using the Inkssentials blending tool and Ranger Distress Ink. When you remove the mask - you have a snowy white hillside! 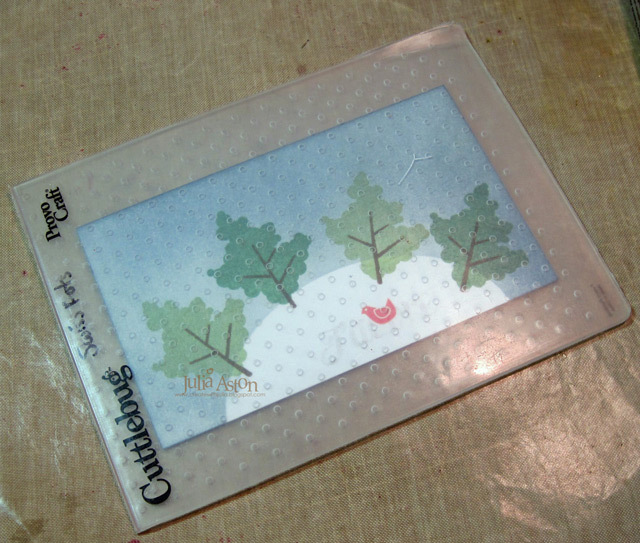 I placed the panel inside my Swiss Dots Embossing Folder and ran it through my Cuttlebug. And now we have 'snow' in the sky! 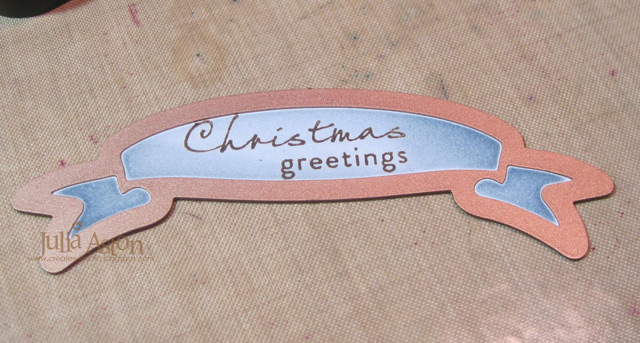 For the final steps - I stamped the sentiment on white, die cut it with a Spellbinders Ribbon Banner sponging the edges before taking it out of the die. Here's how it looks all sponged - leaving it lighter in the center. And when you remove it from the die - you have a lovely white edge! I adhered the image panel directly to the white card base and layered the sentiment banner above it using foam tape. I was really happy with how this came out - it went from vision to card exactly how I thought it would - sometimes it doesn't work out that way! I hope you'll join us in the WMS forum for the Christmas challenge each month! 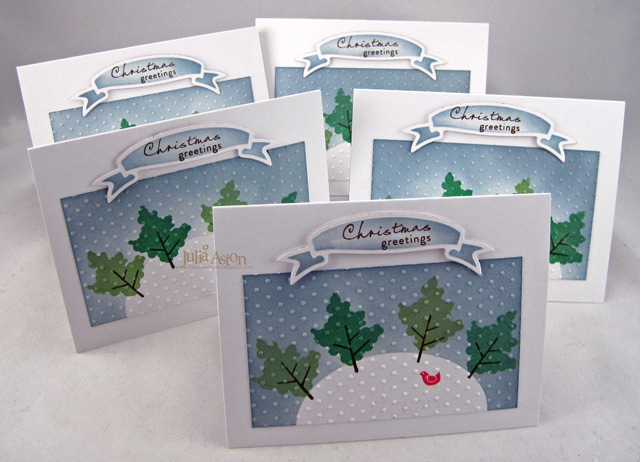 You'll be glad you did when November rolls around and you have all your cards made!! Ink: Archival Ink - Coffee, Memento Lady Bug, Cottage Ivy and Bamboo Leaves, Ranger Distress Weathered Wood. Accessories: Oval Nestabilities, Eclipse Tape, blending tool & non-stick craft mat - Inkssentials, foam tape, Swiss Dots Embossing Folder - Provo Craft, ribbon banners - Spellbinders. Thanks to everyone for the warm welcome last week given to me as April Guest DT for the Color Throwdown challenges! 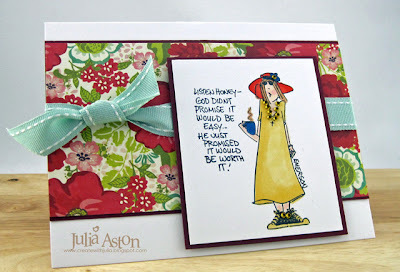 This weeks' colors are from Joan Ervin - another wonderful stamper (and blogging friend) who always inspires me! Here is her challenge to us! My image is from LaBlanche stamps called Spring Birds - I recently purchased several LaBlanche images and I'm really loving how they color up using Cut-n-Dry Pen Nibs and ink pads. I added some Lavender Lace ink to the colors of the birds even though that is not how they appear in nature! (artistic license, right?!) I sponged the edges of the image and the sentiment with Ranger Distress Scattered Straw. 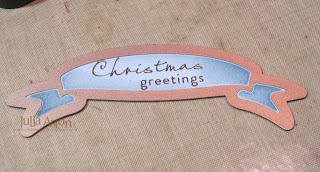 Here's a link to a great You Tube Video on how to color LaBlanche stampings. They recommend using LaBlanche paper to get the best impression with LaBlanche Stamps - it's like glossy paper but not quite as shiny. I used it on my project today. It was a little easier for me this week using 4 colors - by the end of the month I'll be a pro! Bring it on girls!! I hope you'll join along in the Color Throwdown challenge this week - you can check it all out here. Stamps: Spring Bird - LaBlanche, Greetings from Vintage Labels 25 set - Waltzingmouse. Paper: White - PTI, Lavender Lace - SU, LaBlanche Specialty Paper, DP - Simply Chartreuse and Dark Chocolate Pattern Packs - PaperTrey Ink. Ink: Coffee Archival Ink, So Saffron, Lavender Lace & Certainly Celery - SU, Ranger Distress - Scattered straw. Accessories: foam tape, Cut-n-Dry nibs - , wrinkled seam tape - Prairie Bird Boutique Etsy Shop, gradient jewels - Creative charms, Large oval and large scallop oval punches - SU. When did life get SO busy? Are you feeling it?? I used to stamp every single day - now there are days that I just don't have time - although I am always thinking about the next thing I'm going to stamp!! Soooooo - what do I do? I combine challenges!! This card combines three. AND somehow I still made it CAS! I used the colors from the Split Coast Color Challenge - Mary's choices for us were Daffodil Delight, Tangerine Tango and Old Olive. 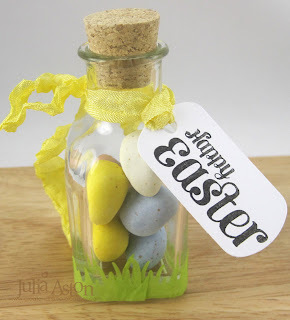 Not having these exact colors - I used a patterned paper that looked to me to have all three in it! I added the large scallop punched panel for the SCS CAS challenge - which was to use scallops. My Thank You is from Join Us by Waltzingmouse. 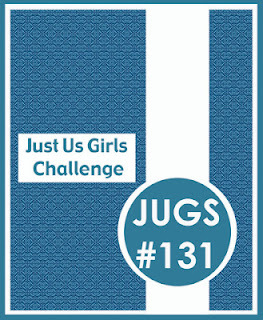 And the sketch I used is this weeks JUGS #131 challenge. A great little sketch isn't it?! Paper: So Saffron - SU, Ripe Avocado, DP Textstyle First Fruits - PTI. 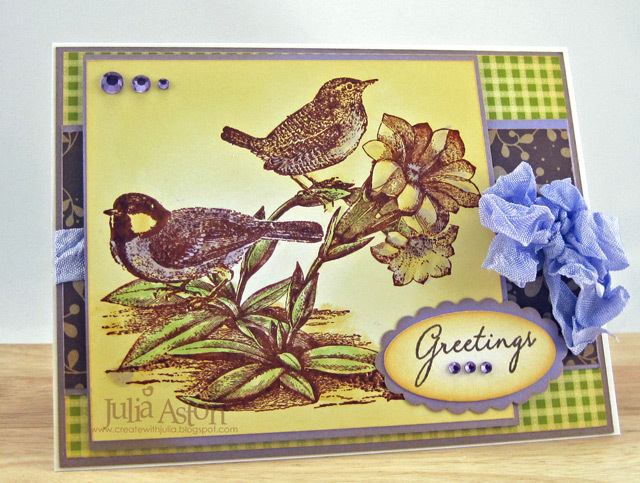 I made this card for the Inspiration Challenge over on Split Coast last week. 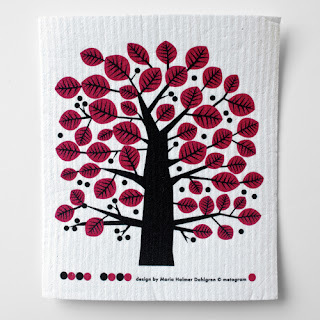 I was inspired by this wonderful apple tree dish cloth sponge on the Inspiration web site - Harabu House. I immediately thought of the Arboscello Tree die by Memory Box and thought I could use some red Stickles on the leaves - and when I tried it, it looked just the way I hoped it would! My sentiment is from the Rescue Remedies Additions Set by Waltzingmouse. Oh- and I wanted to let you know - I've been invited by PouchMart to do some postings of my bag creations on their new blog. Pouchmart is a web store that sells all kinds of bags - that I use often for my crafts - and my first posting came up over the weekend. I'd love if you would check it out here and maybe leave a comment?!! 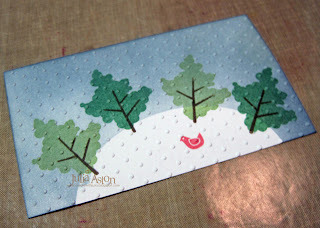 Accessories: glue pen, Arboscello Tree - Memory Box, Xmas red stickles, foam tape, Forest Branches Embossing Folder - Provo Craft. 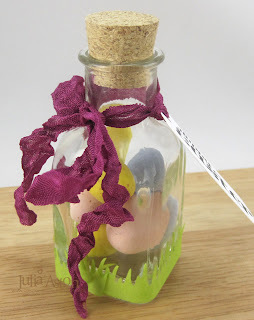 I wanted to share an easy - oh so cute - Easter treat I made this year. I found these sweet little bottles at Michaels (near the wedding area) They come in a box of 18 for $24.99 but they were 30% off so that made them about $1.00 a piece! 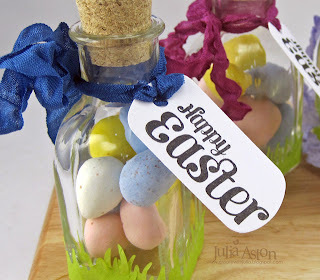 I adhered a die cut row of grass of green tissue paper (grass die from MFT) and filled the jars with Cadbury Eggs. The sentiment is from Compact Sentiments by Waltzingmouse and it's punched with the Keytag punch by SU. I looped some wrinkled seam tape through a hole in the tag and tied it around the bottle. Each one takes about 2 minutes to make. Won't these look festive at each persons' place setting at the Easter Dinner table?! 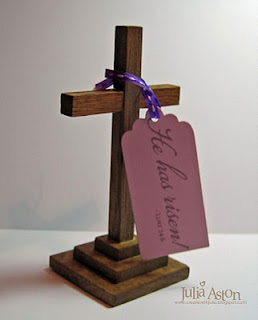 If you are looking for more Easter card/craft inspiration check out these other posts on my blog here. I wish everyone who is celebrating the Risen Lord - a very Happy Easter!